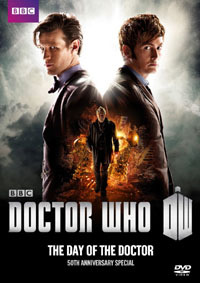 Story: While facing the most crucial decision of the Time War with the fate of his home planet Gallifrey in his hands, the Doctor (John Hurt) is allowed to listen to his future selves (David Tennant, Matt Smith) and witness the consequences of this decision on his life. Is he really free to make any other choice, or is this future now cast in stone? Can the older Doctors ever forgive their earlier self for what he did? How has Kate Stewart of U.N.I.T., 2013, managed to get hold of a 3D painting of the event? And what connects all of this to a Zygon infiltration of the court of Queen Elizabeth the first of England in 1562? Narrated by Colin Baker (The Sixth Doctor). John Barrowman, Karen Gillan, Arthur Darvill, Frazer Hines, Mark Strickson, Matthew Waterhouse, Hugh Bonneville, Noel Clarke, and Sophie Aldred. "The Night of the Doctor" (7 min.) starring Paul McGann (The Doctor). Though this 50th Anniversary special may not quite have turned out to be as much of a massive-multi-Doctor spectacle as many had been anticipating, it does manage to stay focused on a few Doctors and their specific dynamics, and in the end it works quite well as a story. And though writer Steven Moffat appears to be working his way towards some of his usual shortcomings early on, he manages to stay out of the traps in the end. In fact, this really does become the "big" story that Season 33 (series 7) had been needing so badly, and that season doesn't really feel complete without it. There are a lot of loose threads and head-scratching concepts from earlier eras of the show getting both wrapped up and made more believable here, and I predict "The Day of the Doctor" will age well and gain appreciation as time goes on, going down as one of the best stories of the modern era. The opening of the show is pure nostalgia, from the opening graphics, to the theme tune, to the introduction of Clara and the TARDIS. And there we meet the mysterious scientific Doctor, and then launch into the main adventure. It's the first half hour of Doctor Who all over again, completed in about 2 minutes this time. Nice. Of course, U.N.I.T. also makes a significant achievement here in this story. This is the first time on New Millennium Who that it finally features a major returning face from a previous episode, finally lending us the hope that the organization might start to build up a recurring cast with reliable charm. Jemma Redgrave as Kate Stewart delivers her wonderfully solid and trustworthy performance as she did last time in "The Power of Three" (story no. 234), and additionally has a scarf-toting fan-girl named Osgood as an assistant with whom she can demonstrate a bit of comic interaction. All to the good. Of course, one has to wonder if this Osgood is related to the tech-whiz sergeant we all remember fondly from "The Daemons" (story no. 59). It seems to me that the introduction of the War Doctor played by John Hurt - as seen in the 50th Anniversary special itself - doesn't really tell the audience everything they need to know in order to place the character. For that you have to look to the prequel mini-episode "The Night of the Doctor". Viewers may be well advised to watch that first, before sitting down to the Anniversary Special proper. At the same time, it appears that Moffat is revealing things that challenge all the assumptions that fans have been making of the New Millennium series. Is John Hurt some kind of false aberration of the Eighth Doctor - "Doctor 8.5" if you will? John Hurt does actually give a very nice performance in this story, and in the end I do like his Doctor. What he can't quite do (because he is brand new) is give us the sense of nostalgia we usually get from an older returning Doctor during a multi-Doctor adventure. I do wonder why we couldn't have got Paul McGann's Doctor instead taking the place of John Hurt's Doctor. McGann seems to be up for doing additional on-screen work on live-action Doctor Who, and he seems to have demonstrated enough range to handle everything Hurt's Doctor did here. It would have been nice to see McGann nearly double his screentime as the Doctor via this adventure, and the nostalgia factor would have been present and fully functioning. It seems unfair to instead confine his significant contribution outside of the main Anniversary special. For the moment, much as I like John Hurt's Doctor, I want to think of him as Doctor 8.5, no more legitimate than Doctor 2.5 Tony Garner (from "Devious") or Doctor 12.5 (from "The Trial of a Time Lord"), and perhaps slightly less so than Doctor #1 alternate Peter Cushing (from the 1960's theatrical films). Still, I might just have to go and watch John Hurt travel through time in the Roger Corman film "Frankenstein Unbound" again, and pretend he's actually a disturbed War Doctor with amnesia, or something. That film may just become a bit cooler in retrospect now. One source of disappointment during the opening credits was that, after giving us only Matt Smith and David Tennant to look forward to as advertised full blown participating recognizable Doctors, the only other famous returning name presented was.... Billie Piper. "Oh, NO!!!" I thought. Not her again! Again! I really was getting tired of impossible recurrences of Rose that didn't do anything to improve a story. But in fairness, what we get here in this story actually works very nicely. Mostly it's because, despite her billing in the end credits, Piper is not actually playing Rose. She's playing a whole new character - but perhaps I shouldn't reveal exactly who just yet here. Suffice it to say, the new character works well, and it seems to confirm for me that my grudge never really was against Piper, but rather the character of Rose as written. I think Piper is really good here, and ends up playing a far more compelling character. The relationship between Piper and Hurt's characters also works far better for me than the Rose-Doctor relationships ever did. In many ways, Piper's costume seems to be a bit of an improvement on the sloppy stuff she usually seemed to throw on as Rose.... as long as you don't let the camera pull back and count the rips. Oh dear, what's that all about? Can this woman ever get anything better than an old used hand-me-down? Thankfully, I hadn't really noticed such shortcomings during Nick Hurran's main material, but on the DVD extras, with David Tennant teasing her about it, suddenly the costume's shortcomings seemed to be much more in one's face. The most central multi-Doctor delivery of this story comes from bringing back David Tennant, which is absolutely correct and thoroughly enjoyable. Tennant is a favourite Doctor of mine, and it was great to have him on screen again. Nicely, his adventure here will fit neatly into his chronology as part of the extended jaunt of activity he reportedly had just prior to "The End of Time" (story no. 207), making sense of a lot of the off-hand comments he threw at us back then. We also get our best inkling here of the otherwise inexplicable conflict that the end of "The Shakespeare Code" (story no. 184) teased us with. Nice. Moffat's attention to the details and minutia of the show's past is gratifying and rewarding here. Queen Elizabeth the first proves to be an interesting character and is played well by the actress. David Tennant often seemed to gel better with one-off guest characters than with his companions, and the trend seems to be continuing here. There's a fun bit of a comedic gag between them running through this adventure, which provides some good entertainment value while clarifying and commenting on their motivations for some outlandish stuff. Nicely done. Of course, this section does something else that fans have long been waiting for. The Zygons had long been the greatest recurring villains that had never recurred.... until now. Finally, they get the long awaited sequel that they had always deserved. Sadly, as far as their portions of the plot go, it is somewhat less than what they deserved. Very little is really done to explore the aliens' culture, or why this batch came down in 1562, while the ones we know from "Terror of the Zygons" (story no. 80) arrived in a much different time and fashion from who only knows where else. The Zygon look has changed a bit, and not for the better, in my opinion. Not that they have a particularly bad design here, but the 1975 version felt a bit more creepy, mostly because they weren't trying too hard to be scary in obvious ways back then. There are definitely some important factors of the Zygons' previous success that aren't duplicated here. But, getting away from the re-designed face, the rest of the Zygon is quite a good match to the original, and continues to work well here. Perhaps it's too bad they didn't get more screentime to make a stronger impression. I'm not too sure this was the right story in which to bring them back. In the end, their portions of the plot don't quite get enough attention, and it feels like an oversight. But the main draw of this story is elsewhere. The fun goes up a level when the main Doctors of this adventure meet each other and start interacting. As with previous multi-Doctor encounters, there's a bit of ego-centeredness and pseudo-antagonism in their banter with each other. In this case though, they seem to be a bit more pleasant with each other, and a bit more on the same wavelength, which better suits the way that the show, the audience, and television drama in general has grown. Moffat has greatly improved on this aspect since writing an encounter for David Tennant and Peter Davison in "Time Crash". Plus, the differences between the Doctors here in "The Day of the Doctor" become the true central focus of the story's drama. Nice. One of the big criticisms I had of previous multi-Doctor stories was the lack of attention paid to the concept of this being the same person meeting himself through time travel, in terms of the specifics of where each version of him would be in his life and what his memories of his past would look like to each specific Doctor. To his credit, Steven Moffat eagerly embraces these challenges on a regular basis, and does an outstanding job of tackling the question again here. There's MUCH more to be said about this, but I'll save it for the in-depth analysis version of this review, for those readers who have already had a chance to see the show and form their own opinions first. What Moffat eventually comes up with is a bit of a strange notion that I might not buy purely on its own merits, but it so neatly resolves so many plot-holes and potential plot-holes in so many stories, in multi-Doctor adventures, and in others that didn't quite make as much sense in retrospect after the multi-Doctor stories.... in the end I'm going to endorse this new important bit of the mythology. The Doctors take great pride in resolving conflicts through peaceful means, and feel shame for any instance when peace isn't an option. This has been a theme central to the entire show, and sometimes it deals with it successfully, at other times not. Many 1980's stories often brought up the subject, but sadly couldn't think it through outside of a passive-aggressive paradigm. This story is actually kind of clever in its treatment of the subject, and in the way it pulls all of its themes, story threads, and series' minutia together in the end. Of course, I won't spoil that here. Though some may find it controversial, it managed to tick off all the right boxes to gain my picky approval. And that's about all I can say before getting into major spoilers.... meaning about half of my comments won't appear here. The bottom line is that you don't want to miss this show, or the changes to the series that it implies and brings about. Rent it, buy it, tune in, and watch it however you can, then come back to my full review on this page to see how some of the controversial bits may be working a bit better than you would at first think. In short, "The Day of the Doctor" delivers a lot of the best material that we fans could want from this show, while tidying up a few of its longest running arcs so far and apparently re-launching in a slightly different and new direction. Time will tell exactly what that is as we move forward. If this story were to be ranked within the past season, I think it would have to take the top spot. Too much of it was just too correct and satisfying, and congratulations should be offered to all those who participated in it both centrally and peripherally. Happy 50th, Doctor Who! And best wishes for the next 50 years! Region 1 NTSC DVD release December 10, 2013. Dec. 2, 2013. Blu-ray 3D U.S.
Dec. 10, 2013. Blu-ray 3D U.K.
Read the Buyers' Guide Review for the next story: "The Time of the Doctor"